LoFoSo™ Farm owners Mila Bon and Jeff Lambert offer all their animals room to roam, company of their own kind and the opportunity to perform species specific behaviours. Whether they have hair or feathers, stay at the farm long or short, they are all loved and cared for. Mila Bon is an Equine Behaviour Consultant that studied at the University of Guelph and can offer simple exercises based on scientific research that strengthens the bond and bridges the gap between the world of the horse and that of the human. Book a session during your stay, or sign up for one of the special theme weekends! 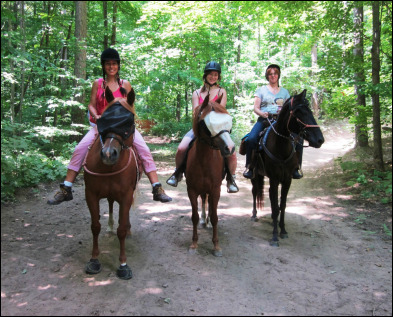 Trail Ride for Breast Cancer in Dufferin Forest, only 10 min. trailer ride away. LoFoSo™ Farm practices sustainable agriculture in the production of plant and animal products using farming techniques that protect animal welfare and the environment. This enables us to produce healthy food for ourselves and our guests without compromising future generations' ability to do so. LoFoSo™ Farm aims to provide a tranquil setting to our guests where horse and human can enjoy nature at its best, enjoy each others company and have the ability to learn to connect at a level beyond imaginable. LoFoSo™ Farm raises their animals without degrading water, soil or other natural resources by using pasture based livestock husbandry. Our animals live in an environment that closely resembles a natural environment with room to roam, graze and stability of a group with the added security of shelter and protection. 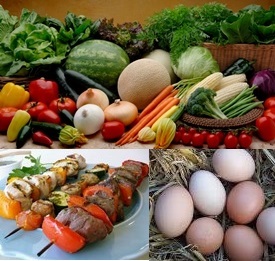 LoFoSo™ Farm produces crops without relying on chemical pesticides, synthetic fertilizers or genetically modified seeds. LoFoSo™ Farm protects the soil from degrading, water and other natural resources from pollution by growing a variety of plants. ​LoFoSo™ Farm protects biodiversity and fosters the development and maintenance of healthy ecosystems.